I recently did a 13-hour road trip driving from Toronto to Eastern Canada, and to past the time I decided to listen to 13 hour worth of Dave Ramsey podcast. I learned about Dave Ramsey just from reading other financial blogs and forums. Dave Ramsey is a financial coach who tries to teach people how to get out of debt and start building wealth. He uses a very simple 7 steps system that every one of his audience can follow. Anyway here are his 7 baby step in the picture below. Before starting any of these steps, it is important to ensure that you have a budget and that your monthly spending doesn't exceed your income. If you can't have a positive monthly cash flow then you'll need to either generate more cash or spend less. Spending less might mean getting a cheaper house or a cheaper car so that your monthly payment is much less. Pretty straight forward, it literally just means putting aside $1,000 in a normal savings account. That is it, don't need to invest it or anything. This step is to pay off all your debt minus excluding your mortgage using a technique call debt snowball. A very common method to build momentum while paying off debt, you can easily google "debt snowball" and learn about it. Once all your debt has been paid off, then you put more money into your savings account, this pile of money becomes your emergency fund. Dave's advice is to keep this fund liquid, the point is not to invest and grow this fund. Then a lot of time Dave will suggest doing these three steps simultaneously, his rule of thumb was to invest 15% pre-tax income for retirement. Then with money left over you can choose however you want to split it between saving for a short-term goal (vacation, new car, down-payment, etc. ), save for kids college fund, and put extra-payment towards your house. Once you have your house pay off then he tells people to be generous and give to a cause that matters to them. 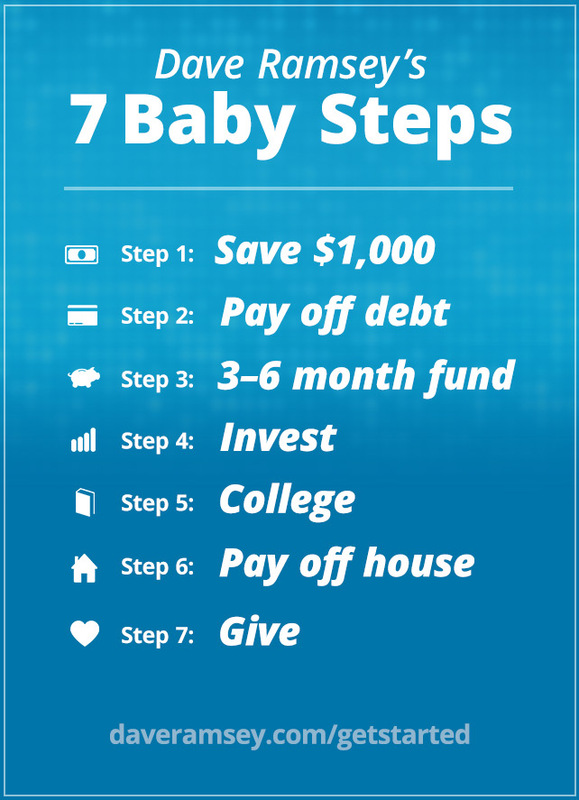 I love the 7 baby step because it's so simple and helps you prioritize what you need to do depending on which step you are currently at. I also like it because it separates a mortgage debt with other debt, in a way it tells people that it is okay to have a mortgage as long as that's your only debt. It definitely took the pressure off me hearing about it, before I put a lot of pressure on myself to be debt free that I was prioritizing mortgage over investment. Now I feel that I can split my money evenly between mortgage, investment, and other savings. A key thing I want to point out is that if you can't invest around 15% of your pre-tax income towards retirement then you'll need to revisit your budget and see where you can cut spending.